Cut specifically for racing, these ladies-fit X-Socks Bike Racing Socks sit low on the ankle and are especially lightweight. This ensures the maximum foot-to-shoe-to-pedal contact, transmitting movement and power in a controlled manner. 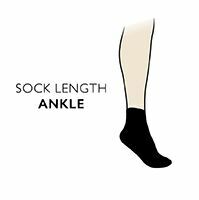 These Swiss-engineered socks are anatomically shaped to the female foot in a wrinkle-preventing ‘narrow arrow’, with midfoot 3-Expand Stripes, a left/right form and an anti-shuffling design. The resulting ‘custom’ fit puts the complex system of padding and protection exactly where it needs to be to reduce the effects of pressure, shock and friction, because the resulting blisters and bruising of unprotected feet can impede performance dramatically. The fabric incorporates patented technologies and climate-controlling materials, hollow core fibre cushioning, anti-allergenic and bacteriostatic components for healthier skin, while a ventilation system of AirConditioning channels create a dry, temperature-controlled environment.